Apple devices are well-known for displaying amazing graphics and touting unique gameplay controls, but sometimes you just need a break from all that fancy-schmancy technology. Ready to go back to old school puzzler roots? Try Ian Price’s B’lox! iPhone app, which gives you 120 puzzles of color-matching, sliding fun. Unlike most games, you can start on any level you want at any time, so you can go easy on yourself with the first few or challenge yourself with the puzzles near the end. Simple and pared-down is the theme of B’lox (which goes well with the old-school look), so controls and objectives follow accordingly. 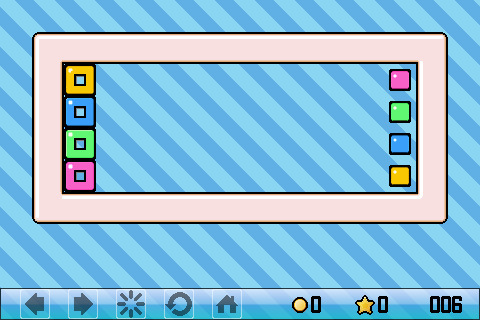 You must make sure that the colored blocks are matched with their like-colored middles, making complete boxes. Slide them by tapping your finger on a block and swiping in the direction you want it to go. 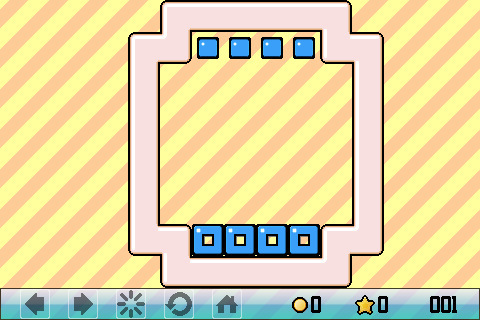 The trick is, the blocks don’t stop until they hit a wall or an obstacle (they slide straight through the pads), so if the pad is in the middle of the field, you’ll have to find some way of stopping the block away from a wall. There are no points involved, but the game does keep track of how many moves it takes you to complete a puzzle, so you can challenge your friends (or yourself) to finishing with a lower number. B’lox! is a throwback to the times when Tetris reigned supreme, so if retro puzzle games are your thing, then B’lox should be in your device. The colors, graphics, and music are what you’d expect from something reminiscent of 16-bit games: primary-colored, plain, and looped electronic-tinged tunes. The main objective is solving the puzzles–which I find easier to do without the music (turn it off in the Options menu)–so I don’t imagine you’d spend too much time on the appearances of the game. I did find myself enjoying the challenge of the higher B’lox levels, and I had friends who threw the game down in frustration, so many of the puzzles aren’t exactly a walk in the park; what would make it more difficult would be the inclusion of more lethal obstacles on the playing field, such as traps or mines. The only major quibble I have is that there is no option to return to the Select Puzzles menu when exiting a puzzle–instead, it goes straight to the main page, which forces me to take an extra step (lazy being that I am). B’lox has a good amount of puzzles for just $0.99, but if you’re not a puzzler fan or prefer fancy-schmancy graphics, I suggest you steer clear. AppSafari review of B’lox! was written by Julie Guan on March 18th, 2011 and categorized under App Store, Fun, Games, Puzzler, Strategy. Page viewed 3715 times, 4 so far today. Need help on using these apps? Please read the Help Page.